Ryan W had the most liked content! Hi, unfortunately, the link in the YouTube PowerPoint presentation was incorrect. This is the correct link to download Andrew's DAS layout and hotkey files: https://bearbulltraders.com/lessons/download-das-layout-and-hotkey-file/ We apologize for the confusion. To anybody that's interested, Andrew, Norm, Carlos and Ryan will be in town for the NY Trader's Expo. We plan on having dinner at 8PM on Sunday, March 10th at The Irish Pub in midtown Manhattan (837 7th Ave, New York, NY 10019) This is an open event and all are welcome to attend. There's no need to RSVP. We will be there hanging out and looking forward to seeing anybody that wishes to hang! If you have any questions, please reply to this topic. Hi Thor, as of right now it would be logistically impossible for us to setup a platform like this and be able to manage it appropriately. We have enabled the Clubs functionality in the forum with the goal of allowing members to create small groups to work with one another under the BBT platform. However, we do encourage all members to communicate as they wish - whether that's through the BBT platform, or outside of it. I am very familiar with the Discord platform and I use it myself. If you are interested in starting a small group, then you may wish to setup a Discord server and channel, or even utilize Slack and invite members that you wish to remain in contact with. We appreciate the feedback and suggestion, but as of right now this is not something we are going to venture off into. But we highly encourage all members to build relationships with one-another and talk outside of the Bear Bull Traders Community. What is a Club? A club is a way for members from the same region, country, city, etc to keep in touch in a more personal and one-on-one way. Clubs are opened for anybody to join, but only the members of those clubs will be able to interact with one another. We welcome all members to create clubs based on any preference. We even recommend creating clubs for support and accountability as well. You can utilize the clubs to create a small group of 3-5 people and maintain contact with each other to monitor each other’s trades and support each other. To create a club: If you create the club, you are automatically the club’s Owner/Leader. You will have special access and control over the club. Creating a club is easy, simply go to: https://forums.bearbulltraders.com/clubs/ then click the large green ‘Create a Club’ button on the right side. Fill out the form that pops up and please keep the club ‘Open’. If you need a private club, please reach out to team@bearbulltraders.com to properly configure this for you and invite the appropriate members. After your club has been created, you will have the ability to invite other members to the club. Members can also see the club on the main clubs screen and will be given the option to join the club by simply clicking the ‘Join Club’ button. The most important step to take after creating your club is to enable the ‘Topics’ feature to allow other club members to chat within the club. To enable the ‘Topics’ Feature: Club Owners/Leaders will need to go into their club. One they are seeing their club, simply click the Manage Club button in the top left corner, then click ‘Topics’ under ‘Add Club Feature’: You will need to provide a name for your Topic and optionally a description. Once you have created your topic, other members of your club will be able to post items and reply to one another. You may also wish to add a calendar if you plan on having any types of events. This is self-explanatory and completely optional. Club Rules and Guidelines Please be mindful of all members of the club and the Bear Bull Trader Community. We are inclusive of all people regardless of race, gender, religion, ethnicity, etc. We have a Zero tolerance policy for any statements that degrade another member’s race, gender, religion or ethnicity. The Clubs are provided to our members as a courtesy to ensure more efficient communication amongst the community. However, if a club or club member shows a lack of respect of other members in the club or community, they will be banned. Furthermore, if a club is encouraging of any nefarious or derogatory behavior, we have the right to shut down that club and ban the members. Please keep all topics on point and related to trading in some capacity. Please minimize any talk about politics, religion, race, etc. Any posts found to be in violation of this will be deleted. If you are the target of harassment by another member, please reach out to us: team@bearbulltraders.com so we can take appropriate action. Also, I do use TradeStation but that's for equities. I was originally using it for Futures, but once I got involved in JigSaw, I never looked back. As I mentioned, I am hoping to utilize JigSaw to trade equities, but the setup is a bit convoluted and I will still have to use TradeStation for charting. Hey guys, sorry for the lack of response on this. Here are some updates: With regards to my day trading strategy on the /ES, I exclusively watch order flow and the tape. I use a special platform called JigSaw DayTradr to accomplish this. It's a proper depth of market (DOM) that includes the inside prints between the bid and the ask as well as the current prints and a volume profile. This allows me to gauge the velocity (speed) at which orders are moving as well as see large orders to help make a decision as to whether we will continue, pull back or reverse. I look for a very specific order flow event called absorption. You see this in equities (Iceberg, refreshing, etc). All essentially the same concept of a larger player absorbing either buying or selling as well as absorbing the stops that are getting hit at that price. The JigSaw platform has what's called 'Auction Vista' which is a essentially a 1 second tick chart that plots dots at the levels of absorption. These areas usually act as support and resistance and can be used to place a trade around. Now, since mid-October the liquidity has really dried up in the /ES. We are seeing 100ish (or less) contracts at each level whereas before the volatility in mid-October, we were seeing 300+ contracts per level. This made it a lot easier to trade as you weren't getting 4-5 point moves in a matter of seconds like you do now. As a result, I've had to take a step back from trading the /ES because the volatility is just too extreme and very difficult to trade (and make a decision quickly enough without risking a 2+ point loss in a matter of seconds). I've been looking at equities again this week and I have to admit that what I learned from trading futures is very much applicable to equities. The bonus in equities is the chart patterns tend to hold up a bit better compared to those found in the /ES. So I am utilizing my knowledge of order flow and tape reading on my TradeStation DOM (The matrix) and of course chart patterns, VWAP and MA's to place trades. I have to say, it's pretty interesting to see how everything works out. I am trying to see if I can use the JigSaw DayTradr platform to trade equities as that will really help give me the upper-hand. The Matrix is alright, but I prefer having the inside prints on the DOM, as well as being able to see the last trade to gauge velocity. A lot of this is tough to put into text as a video would make a lot more sense. Once I am more comfortable with trading equities again (and hopefully able to utilize the JigSaw platform), I will put together a video. Until the /ES returns back to normal, I am going to likely stay away for now. I've spoke with many other futures traders and they are in the same boat - they are too afraid to touch the /ES until liquidity comes back. Many traders are looking at other futures contracts but some of the better ones are the European (EUREX) products which unfortunately, don't trade that well during the U.S. open. @Kasper, I think that's a really interesting system you have in place. I think automated strategies are definitely helpful, but how have they been in this recent low-liquidity, high volatility environment? If you guys have any questions, please feel free to ask here as I'll be monitoring this thread. A Alert: brokerage trading platforms offer an alert feature that can be set up to advise a client by text or email that an event, such as a stock hitting a specific level, has occurred. You may be watching this stock and wanting to enter a trade once the specific event has occurred. Algorithm: a proprietary computer program that executes trades based on programed inputs. The inputs could be technical indicators such as moving averages or they could be newswire feeds where computers will trade off of key words or phrases. Ask: the price sellers are demanding in order to sell their stock. It’s always higher than the bid price. Average daily volume: the average number of shares traded each day in a particular stock. I don’t trade stocks with an average daily volume of less than 200,000 shares. As a swing trader, you will want sufficient liquidity to be able to get in and out of the stock without difficulty. At times this term will also be referenced as “average volume”. Average relative volume: this is the number of shares traded in a stock compared to its average daily volume. I like to see stocks with an average relative volume greater than 1.5, which means the stock is trading more than 1.5 times its normal daily volume. This would likely be due to heightened interest by traders and investors in the stock. At times this term will also be referenced as “relative volume”. Average True Range/ATR: how large of a range in price a particular stock has on average each day, taking into account gaps that occur between market sessions. Averaging down: a technique that some traders employ which involves adding more shares to a losing position in order to lower the average cost of that position. They hope the stock will eventually move back in their favor enough so that they can sell and break-even. I do not average down because this may magnify losses. I stick with my trading plan and sell when I hit my stop out price. B Bear: a seller or short seller of stock. If you hear the market is bear, it means the entire stock market is losing value because the sellers or short sellers are selling their stocks. In other words, the sellers are in control. Bearish candlestick: a candlestick with a big filled body demonstrating that the open was at a high and the close was at a low. It tells you that the sellers are in control of the price for the period represented by the candlestick and it is not likely a good time to buy. Figure 7.4 illustrates 2 bearish candlesticks. Beta: the amount an individual stock will move in relation to the market or underlying asset. High beta stocks or ETFs will move more on a percentage basis than the market or underlying asset. Bid: the price that traders and/or investors are willing to pay to purchase a stock at a particular time. It’s always lower than the ask price. Bid-ask spread: the difference between what traders are willing to pay to purchase a particular stock and what other traders are demanding in order to sell that stock at any given moment. It will change throughout the trading day. Traders will refer to a “wide spread” when the bid and ask are far apart. This spread is partly a function of the stock price. For example, a $300.00 per share stock might have a bid-ask spread of $1.00 versus a highly traded $20.00 per share stock where the bid-ask spread would be $0.02. Broker: the licensed company that buys and sells stocks on various stock exchanges based on instructions taken from investors and traders. These instructions can be placed online and directed to the exchanges or taken by an employee at the company which executes the trade. Having an employee place a trade is much less common today versus 30 years ago when it was the only way to buy and sell stocks. Using an employee is also a much slower process compared to trading online. Bull: a buyer of stock. If you hear the market is bull, it means the entire stock market is gaining value because the buyers are purchasing stocks. In other words, the buyers are in control. Bull flag: a type of candlestick pattern that resembles a flag on a pole. You will see several large candles going up (like a pole) and a series of small candles moving sideways (like a flag). After consolidation, the price will break higher. Bullish candlestick: a candlestick with a large body toward the upside. It tells you that the buyers are in control of the price and will likely keep pushing the price up. Figure 7.3 illustrates 2 bullish candlesticks. Buying long: buying a stock with the expectation that its price will go higher. Buying power: this represents the capital in a trader’s brokerage account. Buying power will vary depending on the type of account you have, the broker’s rules on lending if you have a margin account and what you hold in the account such as cash, shares etcetera. C Candlestick: a very common way to chart the price movement of stocks. It allows you to easily see the opening price, the highest price, the lowest price and the closing price value for each time period you wish to display. Chasing the stock: chasing happens when you try to enter a position and the price keeps moving away from your desired entry. For example, you want to go long on a stock at $4.50 per share and the share price keeps moving higher above your bid. As the share price moves higher, you keep entering a higher and higher bid hoping to get filled. This will negatively affect your reward to risk ratio if you chase the price up too far from your desired entry price. Chatroom: a community of traders. Many can be found on the Internet. As a reader of this book, you are welcome to join the BearBullTraders.com chatroom. Choppy price action: occurs when the price of a stock cycles up and down in a range with relatively small movements of price within the cycles. You should try to avoid stocks with choppy price movements and wait for signals that the stock price is ready to move outside of the trading price range. Churning: this refers to a specific type of price movement where a security will not be trending in any direction. Instead, there are small waves of erratic buying and selling with no significant price movement in one direction or the other. Close (“the close”): this refers to the last hour the stock market is open: 3:00 to 4:00 PM ET. Higher levels of volatility or price movements can occur in the last hour of trading. Consolidation period: consolidation usually happens after a sharp move up or down in the price of a stock. Some traders are getting out of their positions while others that missed the move are entering. This fight between the buyers and sellers causes the stock price to pause before resuming the original trend or reversing. D Day trading: the business of trading stocks based on very short-term technical signals. Time frames of 1 minute and 5 minutes are commonly used to find trades. Day traders do not hold any stocks overnight; any stocks they purchase during the day are sold by the end of the trading day. At the close of every trading day, a day trader holds all cash in their accounts. Death cross: occurs when an uptrending stock changes to a downtrend. The death cross event occurs when the faster moving 50-day simple moving average (SMA) crosses the slower reacting 200-day SMA. The 50-day moves from above the 200-day to below it when the cross is made. Doji: an important candlestick pattern that comes in various shapes or forms but are all characterized by having either no body or a very small body. A doji indicates indecision and means that a fight is underway between the buyers and the sellers. Double bottom: a “W” pattern that occurs in a chart when a stock price drops to a low, bounces higher temporarily, and then drops again back to the previous low. On the second dip lower, the buyers take control again, thus moving the price higher. This creates a strong level of support and is an indication that the stock price will likely continue to move higher. Double top: an “M” pattern that occurs in a chart when a stock price rises to a high and then drops back temporarily. The price pushes higher again but fails to make a new high on the second run higher. The sellers then take control again, moving the price lower. This creates a strong level of resistance and is an indication that the stock price trend will likely continue to move lower. E “Either or” order: this is 2 orders that are entered by a trader. The orders are linked so that as soon as 1 of the orders is filled, the other order is cancelled. This allows you to both set a stop-loss to protect from excessive losses and also enter an order at a profit-taking price. Entry point: when you recognize a pattern developing in your charts, your entry point is where you enter the trade. Exchange-Traded Fund/ETF: an investment fund traded on exchanges and composed of assets such as stocks, bonds, currencies and indexes to name just a few. There is a huge variety of ETFs that are available today where you can play almost any sector or tradable asset. Exit point: this is the price where you plan to dispose of all or part of your position in a security. It can be the profit target price or it could be the stop-loss price. You make a plan before taking an entry and you stick to your plan unless there is a good fundamental reason to change the plan. Exponential moving average/EMA: a form of moving average where more weight is given to the closer dates in the moving average period. The EMA will respond more quickly compared to the simple moving average where all prices over the period are given an equal weight. F Flag pattern: a chart pattern that resembles a flagpole and flag. Flag patterns can be bullish or bearish and represent a strong move, followed by a period of consolidation (which forms the flag part of the pattern) and then there is a continuation in the trend. Float: the number of shares in a particular company available for trading. Forex: the global foreign currency exchange market where currencies are traded. All currencies are traded in pairs, such as the US dollar against the Euro. Forward guidance: refers to comments made by a company’s management that is related to how they see business prospects in the future. The companies may provide earnings projections for coming quarters. These remarks are usually made during an earnings report conference call and can have a significant impact on the stock’s future price movement. Fundamental catalyst: some positive or negative news associated with a stock or a sector, such as a US Food and Drug Administration approval or disapproval of a medicine, or a series of hurricanes in the Gulf affecting oil and building supply prices. Futures: futures are a contract that requires the buyer to purchase an asset at a specific price and future date (such as oil, lumber, wheat, currencies). A seller of the futures contract is contracted to deliver that asset at a specific date and price. These financial instruments are highly risky, only used by sophisticated traders and big companies, and often as part of hedging strategies. G Gap down: occurs when a stock closes the previous day at 1 price and opens the next morning at a lower price, leaving a gap between the 2 prices. Small gaps will often happen between trading days and large gaps will happen if there has been some negative news regarding the stock, associated sector or market. Gap up: occurs when a stock closes the previous day at 1 price and opens the next morning at a higher price, leaving a gap between the 2 prices. Small gaps will often happen between trading days and large gaps will happen if there has been some positive news regarding the stock, associated sector or market. Golden cross: occurs when a downtrending stock changes to an uptrend. The golden cross event occurs when the faster moving 50-day simple moving average (SMA) crosses the slower reacting 200-day SMA. The 50-day moves from below the 200-day to above it when the cross is made. H High-Frequency Trades/HFT: a type of trading done by the computers on the various exchanges. These trades are being executed at a very high frequency and often to make tiny gains on price movements in stocks. There’s no need for swing traders to be concerned about this activity because swing trades take place over days, weeks or even longer periods of time. I Illiquid stock: a stock that has a very low volume of shares traded during the day. These stocks can be more difficult to sell and buy and therefore you may not get the price you had hoped to get on entry or exit. The bid-ask spread can also be wider in the absence of higher daily trading volume. Indecision candlestick: a type of candlestick that has a small body and similarly sized high tails and low tails. They are referred to as spinning tops and they usually indicate a fight for control of the price between the buyers and sellers. It’s important to recognize an indecision candlestick because they often indicate a pending price change. Indicator: an indicator is a numeric value produced from a mathematical calculation. The calculation can be based on a stock’s price or it can be based on both price and volume. These numeric values can be used as a gauge of trader and investor sentiment toward a stock or security and are often used to scan the market for trading opportunities. Understanding these indicators can help you find and execute trades. Institutional trader: a trader who works for an investment bank, brokerage firm, mutual fund or hedge fund. Intraday: trading all within the same day, between 9:30 AM and 4:00 PM ET. Investing: investing involves purchasing some asset and expecting it to grow in value in the short term or the long term. Investment account: a regular brokerage account that allows you to trade stocks up to the maximum value of the cash in your account. L Lagging indicator: lagging indicators are indicators that provide you with information based on activity that has already taken place, but they do not provide any guidance for a future event. Leading indicator: leading indicators are indicators that provide some information about what the future could hold. For example, an increase in building permits filed likely indicates higher levels of construction activity. Level 2: a tool commonly used in day trading that will show you buying interest and selling interest (bid and ask) at various price levels. It is not applicable to swing trading. Leverage: the margin your broker provides you based on the capital in your account. The leverage varies between brokers, what you are holding in the account (cash and securities) and share price. Limit order: an instruction you give to your broker to buy or sell a stock at a specific price versus a market order which is filled at the best possible price at that time. There is a chance the limit order will never be filled if the stock price moves away from your order. Liquidity: liquidity means there is sufficient trading volume in a stock for you to be able to enter and exit a trade around where you target. You always want to ensure you can easily get in and out of a trade. Long: being long or “going long” means you have purchased stock in the hope that it will increase in price. For example, “long 100 shares Tesla” means you have purchased 100 shares of Tesla in anticipation of their price increasing. Low float stock: this is a stock with a low supply of tradable shares. Usually, this means less than 10 million shares available for trading. When there is a large demand for shares in low float stocks, their price will rise dramatically due to the shortage of shares available to own and trade. These stocks are typically lower-priced shares and can represent good trading opportunities. M Margin: the leverage or borrowing power your broker gives you to trade with based on the assets (money and stock) that you hold in your account. Margin account: an account that allows you to buy and sell using margin or leverage based on assets held in the account. Margin call: a notification you receive from your broker that the assets in your account no longer meet their lending requirements. This will happen when you have trades that are going against you and the account value is decreasing. Immediate action needs to be taken by adding more cash to the account or exiting some current stock positions. Marketable limit order: an instruction you give to your broker to immediately buy or sell a specific stock within a range of prices that you specify. This helps you to get a fill but not to overpay for an entry. Market cap/market capitalization: a company’s market capitalization is the total dollar value that investors consider a company to be worth. It is calculated by multiplying the share float by the price of the shares. A company with a float of 50 million shares that trades at $10.00 per share is considered to have a market cap of $500 million. Market maker: a broker-dealer who offers shares for sale or purchase on a stock exchange. The firm holds a certain number of shares of a particular stock in order to facilitate the trading of that stock at the exchange. Market order: an instruction you give to your broker to immediately buy or sell a specific stock at the current price offered on the bid or the ask. You get an immediate fill on your order but the price could be subject to volatility and there is a small chance you may not get the entry price that was expected. Medium float stock: a stock with a medium-sized float of between 10 million and 500 million shares. Mega cap stock: a stock with a very large number of shares. For example, Apple Inc. has over 5 billion shares available for trading. Micro-cap stock: a stock with a low supply of shares available to trade at a relatively low price. The market capitalization of the micro-cap stock (also called small cap) ranges between $50 million and up to about $300 million. Mid-day: 11:00 AM to 2:00 PM ET. During this time the market trading volume often drops off a little and then picks up again into the close. Moving average/MA: this is a widely used trading indicator that is calculated by taking past closing stock prices for a certain period and then averaging them over that time. Two commonly used MAs are the simple moving average (SMA), and the exponential moving average (EMA), which gives more weight to more recent prices and therefore reacts more quickly to changes in sentiment. O Open (“the open”): the first one hour the stock market is open: 9:30 to 10:30 AM ET. Trading volume is often higher during this period. Options: a specific type of vehicle for trading. Options are a contract that gives a purchaser a right to buy or sell a security at a certain price by a specific date. They can be used in a number of different trading strategies and are considered to be a more sophisticated trading vehicle. Over-the-counter (OTC) market: the OTC is another venue or way to trade different securities such as less regulated stocks. P Paper trading: this is a technique that can be used by new traders to develop and test their skills before risking their money. You start with an imaginary account and go through the process of scanning and finding stocks for trading. You record the trades that you would take on paper with a plan for an exit (profit or loss). You then monitor the stock and record the profit or loss on the trade after one of your exit points are hit. Penny stock: the shares of companies that trade at lower prices. The share prices are typically under $1.00 per share. Position sizing: refers to how many shares you buy or sell per trade. Recall that you should not risk more than 2% of your account in any one trade. Pre-market trading: regular trading on the stock markets starts at 9:30 AM ET and ends at 4:00 PM ET. Some brokerages will allow traders to trade before the official open and after the close. This is called pre-market and after-market trading. During this period, liquidity is often lower and volatility is much higher. This is not a good time for swing traders to trade. Previous day’s close: this is the closing price of a stock on the previous day. If a stock closes on or near the high of the day, then it may be an indicator that the stock price will continue higher on the following day. Price action: a term that is used by traders to describe the movement in price of a stock. For example, if a stock price is dropping, price action is considered poor and likely a good short opportunity. Profit target: this is the expected exit price of a profitable trade opportunity identified by a swing trader. It is based on reviewing your charts and identifying the reward and risk in each trade. R Real-time market data: real-time market data allows you to see current bid and ask prices as well as last trade price and volume of shares. You need to ensure that you are using real-time data as some sources offer data that can be delayed 15 minutes or longer. Relative Strength Index/RSI: a technical indicator that compares the magnitude of recent gains and losses in the price of stocks over a period of time to measure the speed and change of price movement. Your scanner software or platform will automatically calculate the RSI for you. RSI values range from 0 to 100, with an extreme RSI below 20 or above 80 definitely catching my interest. Retail trader: individual traders who do not work for a brokerage firm or manage other people’s money. Risk management: this is one of the most important skills that a successful swing trader must master. This is done by only entering trades with a good reward to risk ratio, risking 2% or less of your capital on any trade and following your trading plan with stop-losses and targeted profit gains. Risk to reward ratio: this ratio is determined by assessing how much you expect to profit in a trade versus the most that you would be prepared to lose before exiting the position. Good trades offer at least 2 times the reward compared to the risk. For example, if you expect to make a $2.50 per share gain and are prepared to stop out if you lose more than $1.00 per share, then the reward is 2.5 times the risk and it is a good trade from a risk to reward perspective. Rotation: refers to a process where investors and traders move their money from one sector to another. One sector may fall out of favor with investors and they will move their money to another sector that they consider to have a better opportunity for a return on their investment. S Scaling out: a process you use to take advantage of a longer-term trend in a security. Instead of selling all of a profitable position at a target price, you will sell a portion of the position at the first target and hold the remainder for more gains. You should move the stop out price up to a level that is close to the first targeted sell price so gains are not given back. Scanner: software that you program with various criteria in order to find stocks that could be setting up for a profitable trade. Scanners are available on the Internet and are also supplied by some brokerage firms as part of their trading platform. Sector: a sector is considered to be a group of stocks that are all in the same business. For example, the financial sector refers to banks and other financial institutions, with companies such as Wells Fargo, Toronto-Dominion Bank and JPMorgan Chase in that sector. Short: an abbreviated form of “short selling”. It occurs when you borrow shares from your broker and sell them. You are expecting the price of the shares to drop and you are hoping to return the shares by buying them back at a lower price. If you say that you are short IBM, for example, it means you have borrowed and sold IBM shares and are hoping their price goes lower. Short interest: this is the number of shares in a stock that have been reported to be sold short by the brokers. Brokerages are required to report to the exchanges how many shares they have loaned out for short positions. A very high short interest (greater than 20%) is an indication that a lot of investors and traders hold a very negative sentiment toward a stock and the consensus is that the share price is going to go lower. It can also cause a “short squeeze”. Short selling: this occurs when you borrow shares from a broker and sell them with the expectation that the price will go lower and can be bought back at a lower price. You return the borrowed shares to your broker and keep the profit. Short selling restriction/SSR: a restriction placed on a stock when it is down 10% or more from the previous day’s closing price. Regulators at the exchanges place a restriction on short selling of a stock to prevent short sellers from continuing to drive the price down. The restriction only allows a short entry when the price of the stock is going higher. Short squeeze: occurs in a stock where there is a significant short interest. If some positive news comes out about the company, the price may move aggressively higher. Traders who are short get very worried and start buying shares to cover their positions. Combined with the investors and traders buying on the good news, this can create a frenzy of buying which will drive the stock price higher and higher. Short squeezes are bad to be caught in and good to ride higher. Simple moving average/SMA: a form of moving average that is calculated by adding up the closing price of a stock for a number of time periods and then dividing that figure by the number of time periods. As the time period moves forward, the oldest price is dropped and the newest period price is entered to calculate a new value. Simulator: some brokerages offer simulator accounts that start with a set amount of “fictitious funds” or “imaginary money”. You can use the simulator to trade with the imaginary money, allowing you to develop your skills and build experience in trading. This is similar to “paper trading”. Size: the bid-ask information on a stock order page will also likely display the “size” or number of shares being bid for (wanting to buy) and the number of shares being offered for sale. This will change often throughout the trading day on an actively traded stock. Spinning top: a type of candlestick that has similarly sized high wicks and low wicks that are usually larger than the body. They can be called indecision candlesticks and they indicate that the buyers and sellers have equal power and are fighting between themselves. It’s important to recognize a spinning top because it may very well indicate a pending price change. Split adjusted: after a stock split the price will drop in relation to how many new shares were given to current shareholders. A stock may be split more than once if it keeps going higher over time and, with each split, the price will drop. A split-adjusted price is the price a stock would have been before the split or splits. Standard lot: a standard trading size is 100 shares. The “size” column on the stock order page will indicate how many standard lots of shares are being offered for sale or purchase. For example, a bid size of “4” means there are buyers waiting at the bid to purchase 400 shares at the bid price. Stock in play: stocks in play are shares of a company that are being actively traded by traders and investors. They are characterized by higher than normal trading volumes in the shares being traded and by more price movement than previously experienced. Stock split: on occasion a company will want their share price lower to allow more potential investors to buy and own their stock. For example, a stock that trades at $300.00 per share may be too expensive for many investors to own. To address this issue, a company will split the stock so all of the existing shareholders own more shares. In order to do this, they could perhaps offer another share for every one a shareholder currently owns. With twice as many shares in the market, for the value of the company to remain the same the stock price will drop by half. In our example, the share price would drop to $150.00. Stock ticker: short abbreviations of usually 1 to 5 letters that represent the stock at the exchange. All stocks have ticker symbols. Apple Inc.’s ticker, for example, is AAPL. Stop-loss: prior to entering a stock position, you must determine what is the maximum you are prepared to lose on a trade. This level could be based on an indicator or pattern. You enter a position hoping for a profitable trade but if this does not occur then the stop-loss is used as an exit point to protect your capital from greater losses. Support or resistance level: these are areas in a chart where share prices often reverse or pause. There can be areas where resistance to further price increases occur and there are areas where the downward price pressure ends and the share price pauses or moves higher. These areas often repeat, as if the share price has a memory. Swing trading: the serious business of trading stocks that you hold for a period of time, generally from 1 day to a few weeks. Swing trading is a completely different business than day trading is. T Technical analysis: this is an analysis method that is used to forecast the future direction of prices by studying past market data. The data used is primarily price and volume. Trade management: this is what you will do once you enter a trade. You will monitor your position and be prepared to take a profit or get stopped out and take a loss. Trade plan/trading plan: the plan you develop before entering a trade. The plan includes determining an entry price and an exit strategy with a profit target price and stop-loss price. The plan concludes by closing the position and then recording and reviewing the result. Trading platform: this is the software that you use for sending orders to the exchange. All brokers will offer a trading platform. Trailing stop: this is a technique used to stay in a position as it continues to move in your favor. As the trend continues, you move your stop price to trail the move so that when the trend does finally change, you capture most of the profit in the trend. V Volume: the number of shares that are traded during a period of time. The period could be daily, weekly, monthly, etc., or the current volume during the trading day. W Warrant: a right to purchase shares in a company at a specific price. Warrants have an expiry date so they can expire worthless if the actual share price does not move above the purchase price on the warrant. Watchlist: you may build a list of stocks that you are interested in taking a position in. You may very well not be ready to enter at the time the stock first catches your interest and, instead, you are waiting for a confirming event like a bounce off of a double bottom. In this case, you build and maintain a watchlist of potential future trades. The brokerage may also offer an alert feature on their platform so you will be advised when the confirming event occurs. I found this little gem: https://www.youtube.com/watch?v=0VKyIbTotns the second part is in the link of the YouTube video. It's a tad long, but well worth the watch since (most of us) are familiar with Mark and his concepts on trading psychology. Enjoy! Just an FYI, Andrew will be coming into town on September 15th. So we will have our Meet up then. Will work on additional details soon. Ok guys, just spoke with Andrew and the weekend of the 1st isn't going to work. We will have to look into mid-September like the 15th, 22nd or 29th. Hopefully we can nail down a date that works for everybody. Hey guys, still trying to determine the best weekend for this now that we are pretty far into August. Andrew isn't available the last weekend, so we may have to look at the first weekend of September. Are there any takers for the weekend of 9/1-9/2 ? If not, we can look at other weekends in September. Hey guys. I just wanted to put together a little document on what I have been doing to learn the /ES. This isn’t exclusive to futures, this is for ALL trading and for those looking to give themselves the edge and to take their trading to the next level. This document is for beginners as well as jaded traders such as myself. The point here is you need to adjust how you view the market and change your thought processes. Recording Trades This may seem like a no-brainer, but not many people do this. I didn’t realize the power of recording the market until I started doing it. There are plenty of free programs out there (I use Open Broadcaster Software, OBS: https://www.obsproject.com). Since I am only trading 1 instrument, I just need to record my primary monitor. 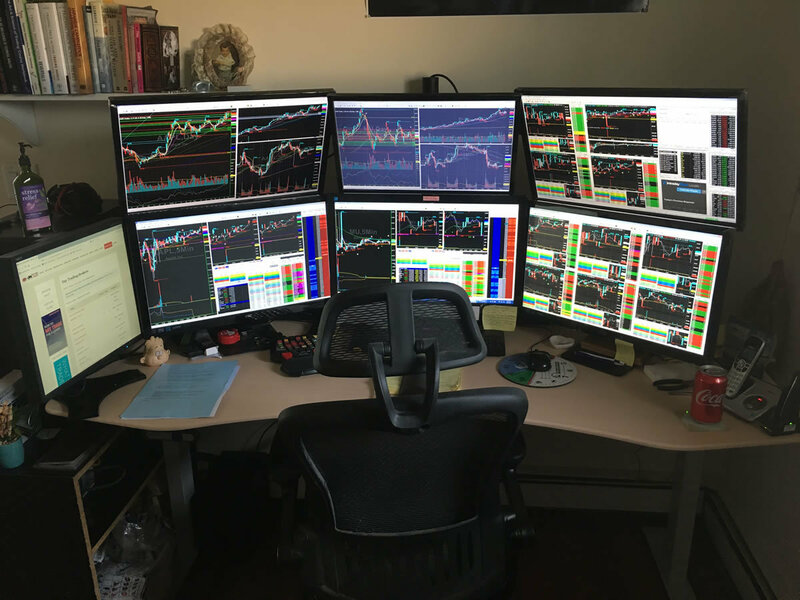 If you are trading equities and use several monitors to trade from, this may become a bit of a challenge. However, you should really only try to focus on 1 stock as it is anyways. In this case, you can record the screen that you are trading from. The other option is, just record 1 screen and ONLY trade from that screen. I also highly recommend that you record the entire day’s action, even if it’s just 1 stock that may die in the middle of the day. The reason for this will become clear in the next section. But the point here is that you NEED to be recording what you are doing, because in the heat of the moment, you don’t always know what is happening, but the recordings can help you with that. Reviewing your Trades If you record your trades, like I mentioned above, then you absolutely need to spend time reviewing your trades. I know many people here simply copy and paste their trades into their journals, put in a little blurb about what they saw happen, then never go back or care to look at it again. While this is good in practice, unless you are actually reviewing your trades in depth (and you are able to remember what was happening and going through your head at that time), there’s really no value to the journaling; you need to review! This is where the recordings come in. I mentioned in the chat that I record the entire day then I go back in the evening and re-watch everything. While this may seem a bit extreme, this is the only way you can improve your skills. Why? Well think about it this way, in the heat of the moment while the market is open and you are trying to trade, do you think you are really seeing every possibility? Are you seeing the probable outcomes of your trade? Probably not! Furthermore, you are under the “gun” so to speak of getting in at the right spot, managing the trade and exiting with a profit or a loss. This all happens at lightning speed and sometimes, you don’t even have a second to think about what is happening. When you re-watch the recordings in the evening, you are more relaxed and you can observe A LOT more of what is happening in the market/with your trade than you can while it is happening in real-time. Even doing your journal review at the end of the day, you are still a little stressed from the day and may not remember/see everything that you thought you remembered or saw. This is especially true for a really bad day. You do not need 6 and a half hours at night to literally re-watch what you already saw earlier in the day. Instead, scrub through the recording (this means taking the time scroller and moving it to different sections of the video) and find important points in the market action. Areas of major support/resistance, technical levels, VWAP, moving averages and most importantly, reversals. If you focus on these areas exclusively, you can start to see what is happening at these key spots and learn what to look for. Also, do not do this right after the market closes. You need a few hours to decompress after 4PM EST. If you jump right back into it, your mind is still going to be fried and you will be missing out on key points, so take a break and do this after dinner and before bed if you can. The recordings allow you to calmly review the market action, what you did right and what you did wrong and learn from what you are seeing, which leads me to my next piece. Taking Notes Of course, we all went to school at some point in our lives and had to take notes on what the teacher or professor was telling us. Or, we read several textbooks and took notes on that. Trading is no different. We are in school essentially trying to learn a rather subjective subject with about a million variables going on at every microsecond. But, there is a lot of information in all of this noise and by taking proper notes, you will be able to find small pieces of information that can help you gain your edge. Now, taking notes, trying to trade and also watching the market is literally impossible. Some people use dictation software and speak into a microphone that records their statements either into a document or just a voice recorder. This is an incredible process! I tried it but the dictation software didn’t understand me and since I hate the sound of my own voice, re-listening to myself is impossible (yes this is petty, but something about my high-pitched nasally voice drives me batty). However, if you have a pen and paper available and you can quickly jot down a quick note, even if it’s an important price level where you saw a large order get executed, will still be very helpful. However, what I am getting at here is if you do the recordings like I mentioned above, then you will have a much easier time taking notes when the market is closed, you are relaxed and you can focus a bit better on the action. You would be amazed as to how much information is out there when you are able to sit back, relax and just watch and take simple notes of what is happening. However, I have found an even better way of note taking for trading which is in the next section. Asking the right questions Everybody learns at different paces and via different styles. One way of learning that I felt has been dramatically helpful for me is simply asking a question then finding the answer to it. While we can read books, watch videos and listen to others talk about their trading, until you truly understand the “why” or the “how” you are just blindly following somebody else around and this will get you into trouble. When you are unable to look at the market from a purely objective perspective, then you cannot understand what is actually happening. I’ll get into this more in the next section, but it’s important to discuss here. If you come up with questions about things you are seeing or things you are not understanding, then you will be forcing yourself to find the answers to those questions and forcibly build your knowledge. Because now, you are seeking the answer instead of being told simply “look for this”. Well, “how do I look for this, why do I look for this?”. Here’s an example: “Do value areas and High-Volume Nodes (HVN’s) on the DOM (Depth of market) provide entries and price targets?” This is a question I wrote down on my notepad and I am working on answering. Another question you can ask yourself is “How strong is the VWAP in AAPL? Does AAPL respect its VWAP?” Or, “What happens when a large order is executed on Level 2? Does price retrace then try to retest that price again? Is price being held down by a large player”? It is then your job to find the answers to these questions. You won’t find the answers in one day or in one recording, but now you have something to work with. Just sitting at your screen, watching the live market or even a recording without any direction or guidance isn’t going to help you. I know because I spent 4 years doing this. Sitting at the screen and trying to make sense of what is going on with all of this noise. Well, by not having questions to answer and trying to seek the truth or answers within the noise, I just sat there and wasted my time getting lost in all of the noise of the market. Get a pad and a pen, write down your questions then watch the market live and most importantly, watch the recordings and find those answers. Once you find the answers to your questions, watch how your trading changes. Charting your own path (pun-intended) I mentioned above that most of us like to follow something blindly, especially in such a complicated environment as the markets. But you need to learn to think for yourself and think objectively. As humans, we need structure. It’s how our brains work, it’s how we live our lives – with structure (and lots of it). We are logical beings and we need “rules” in order to function properly. Everything in our lives has structure and a set of rules. Driving, working, sleeping even eating. There is structure and rules in place for everything in our lives. Trading is no different. So, we seek out ways to find rules that say “If a then b”. Well, I hate to break it to you but most rules don’t work. The market isn’t about absolutes. Far from it. There are millions of people in the market place (as well as machines) all making decisions based on their subjective point of view of what they “think” will happen. Sure, some people do have rules and I am not saying you shouldn’t have any rules – quite the contrary, but you need to understand that just because you have a horizontal line on your chart from a higher-time frame doesn’t mean that price is going to touch it to the penny (or tick) and bounce off of it. This happens, but usually, you have larger players that know that all retail traders are looking at that level and most people have stops there. So, the large players will throw a bunch of money at that zone to break it and trigger the stops, then take the money from the stops getting hit and push price back down and even further lower. Well guess what your “rules” told you… “let’s go long when price breaks this level”. Guess what just happened? Johnny Stock at Goldman just pushed price through the level, trapped you (and millions of others) into a failed trade, then sold it faster than cold water on a hot day, just to get a better price. This happens all the time. This is why you need to answer QUESTIONS rather than have rigid rules that tell you A=B. Because that’s not how this works. Yes, rules for stop losses and profit targets are critical and you can be somewhat rigid on those, but just understand that you need to think for yourself in this and develop your own way of viewing the market. Having somebody like Andrew at your disposal is critical because while I encourage you to answer your own questions by putting in the time watching the recordings, Andrew can absolutely help you in getting the answer a little bit faster and even assist you in finding that answer. And it’s not just Andrew, anybody here in our wonderful community can answer your questions. We are all here to help one another out and to work together. I implore you to come up with some questions (only after you have watched the markets long enough and watched some recordings) and find the answers to those questions. Everybody is different and the questions and answers you have may not work for me, but that’s quite ok. We are all here to build knowledge on the market and to most importantly, learn for ourselves and develop our own style of trading. While it is impossible to master the market (anybody who says they have is full of themselves), we can certainly take advantage of certain imbalances. If you think you mastered the market, you have a rude awakening coming because the market is impossible to master and will put you right back in your place. But put in the time and effort, and you will be rewarded. Do not look at trading as a way to get rich quick or start making tons of money, because you will just lose tons of money with this mindset (I know from personal experience). Treat the market like it’s a school and a game that you need to learn the strategies of. Approach it like this and follow what I said above and you will reach success IN TIME. Hey everybody! I wanted to see if we could possible setup another meetup for sometime in August for the NYC metro members. We had an incredible turnout the first time around and we've only grown since then! I know Fernando and Carlos will attend and maybe, just maybe we can get the 'boss' to attend as well. So I am putting this out there to see what everybody thinks. Throw out some dates and lets see if we can come to a consensus! I know I am available every Saturday except for the 11th (beer festival at Heckscher State Park out here on the Island), but other than that I am free!